An invited writer, Cay Sophie Rabinowitz, Senior US Editor, Parkett Publishers, New York, selects two gallerists - Henry Urbach, New York and Brian Butler, Los Angeles - to each choose two artists whom they do not represent for a group exhibition, with the writer contributing a text. Henry Urbach has selected Paul de Guzman and Wade Guyton. Brian Butler has selected Efrat Shvily and Liliana Moro. The strategy set forth in this exhibition, and in some sense in every work featured in it, involves an interruption: of protocol, of space, of place, of context. When asked to select two gallerists, each to be featured with a choice of artists, I decided to integrate this Summer Exhibition into an ongoing discussion I have been developing with two gallerists on opposite coasts. One seemed to talk a lot about a need to relocate and expand his gallery space, while the other seemed to question whether to maintain a designated space at all. One seemed to focus mostly on representing a specific group of individual artists by organizing exhibitions in the gallery, while the other seemed to demand a more fluid, open format. Each seemed to be searching for a new identity, given the limitations of making a profitablecommercial gallery the place for interesting artistic interventions. As the world of art continues to assume many values characteristic of the world of business, both artists and gallerists embrace the branding practices of corporations by developing an image or look to sell, clone, and distribute widely. All this has taken place without much resistance. Times have radically changed since the 1970s, when the influential art dealer, Seth Siegelaub, played a significant role in the conceptual art movement by pioneering innovative techniques for marketing and advertising his stable of artists and their work. In the spirit of Siegelaub's Artist's Reserved Rights Transfer and Sale Agreement (a document designed to limit the disproportionate control of art by museums, galleries, and collectors, and to support individual artists' rights), one gallerist represented in this exhibition has been reevaluating the practice of organizing exhibitions and selling art. Specifically, he has been trying to develop a protocol for transferring the ownership of works to museums, and has traveled internationally to support projects and discussions with artists which challenge the cultural tourism of artists' identities and the branding of culture. If I have been more involved in the curatorial process than former Summer Exhibition organizers, one can assume that this, too, is a necessary result of both the larger, global art world and the particular group of participants in this show, who constitute a smaller, but representative art community. New forms of collaboration are demanded, by both the art world at large and the specific one defined here by myself, Brian Butler, and Henry Urbach, and the artists Paul de Guzman, Wade Guyton, Liliana Moro, and Efrat Shvily. apexart provides a space for interrupting the normal course of a commercial gallerist's activity. But I have interrupted the normal course of activity for the Summer Exhibition by failing to merely receive four artists' names. I considered each gallerist's situation, and encouraged them to choose artists who might nurture their reexamination of their professional practice. I suggested art works which would resist the trend towards simplifying the exchange of ideas. I also wanted to discourage the easy translation of a theme into a selection criterion. The result seems to be a group of works with a uniÃ„ed appearance, but with radically distinctive concerns. Each is elusive about its identity — an antidote to the commodiÃ„cation of an idea. Wade Guyton appropriates modernist and minimalist shapes and products which he then reiterates, reconfigures, rescales, or redesigns. In the gallery these sculptures, made in wood, steel, or aluminum, are presented as if to be completely new. Though even in its most unlikely configuration a Breuer chair may always contain the memory of its signiÃ„cance, in the exhibition it appears too absurd to be endorsed by any company or installed in any home. This erratic steel drawing, made from an apparently rejected source, balances haphazardly on the edge of another formal object frequently used by Guyton, the isosceles triangle, and communicates with his work U Sculpture, resting more comfortably on an opposite side. A literal translation of Guyton's appropriation would wrongly limit the critical potential of his project, which thrives on being unresolved — especially about how to make a place where sculpture can convey meaning. Paul de Guzman inserts himself into the canonical works of contemporary design and criticism by cutting sections from architecture books and anthologies which have become authorities on meaning and interpretation. While many a theory in the books appropriated and altered by de Guzman may in fact be disputable, the artist does not seem to be enacting his apparently irreverent attack on the books' published content. As much as one might expect the book-object's design to be linked to ideas professed within its once legible pages, it seems that a work's design is subject to the artist's whim and has little to do with the source material's subject. 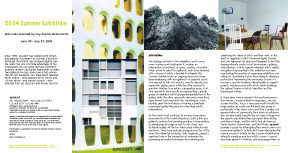 A release from the impulse to interpret visual artistic practice through the automatic appeal to a few books of philosophy or architecture, Study for Wenn Berlin Biarritz wäre... and Proposed Double Layout for T. F. seem a declaration of de Guzman's right to be an artist and not merely an interpreter of theories in books. The dichotomy inherent in Paul de Guzman's oeuvre is more complex than any literal translation of dissection into a meaningful gesture. The result can be likened to the complex logic of Efrat Shvily's photographs, described by Ariella Azoulay as being distinct from any photograph on the wall. A photograph usually is "dangling between two modes — between what's depicted on the photographic paper and traces of the photographic act, between the two-dimensional image and the chaos of reality out of which it was forged, between being a silent picture on the wall and being (the traces of) a scrap of the world teeming with life. "1 Upon closer examination, Shvily's images of buildings that look like architectural models do not communicate definitively. A repeated gaze, an analysis of the conditions surrounding each encounter, a serious study of the history of the occupied territories — even such genuine and conscious considerations of the work’s intention will end in a lack of resolution. No meaning can be predicated upon this photograph's information; no translation can be enacted on its symbolic presentation. In Shvily's work Untitled, I-92-1, the place is occupied yet barren, devoid of human spirit. Rows of half-built poured concrete foundations and box structures on a hillside in Untitled, A-94-2, seem both in process and interrupted, both invested with hope for a new beginning and abandoned as a hopeless cause, both a utopia in the making and one long since failed. Likewise Liliana Moro's Un Mondo senza testa (A World Without a Head) appears to be a stage set for ideal communication, but as an autonomous situation in the exhibition space, it confounds. The work's uncanny power lies not merely in the inconsonant materials and scale of the chairs, table, and paper guillotine, nor in the sound of cheering crowds surrounding an otherwise mute (or as yet unexpressed) configuration. More importantly, it originates in the work's confounding of the viewer's activity. Moro demands that the spectator become an active participant but decidedly only feigns to deliver an understanding. Each of the works in this show somehow interrupts convention, leaving unfulfilled the expectation that form can be decisively linked to meaning. At first glance, these works seem formally rigid, minimal, reduced, and controlled. This makes them even more interesting as a group of works for communicating the failure of art to communicate. It becomes a celebration of the poetic, and of the possibility to look right but be wrong. Wade Guyton's installation strategy makes a mess of our understanding the minimalist forms he has borrowed. In Shvily's disturbingly quiet scenes of extreme violation there remains no division between what the work is about and how it communicates. De Guzman intimates that his engagement is an interruption of published ideas, but then demands that his cutting be otherwise evaluated. As the crowd cheers and viewers take a seat at one of the discordant chairs surrounding Liliana Moro's elongated coffee table, it seems implausible that the paper guillotine has been borrowed from a children's book. Given the complacency of most spectators, in exhibitions and in the world, it seems justiÃ„able to interrupt, just once, the expectation that all will present itself as planned. 1. Ariella Azoulay, "Photography as a Barrier to the Euphemistic Gesture" in New Homes in Israel and the Occupied Territories, Rotterdam, WITTE DE WITH Center for Contemporary Art, 2003, p. 83.